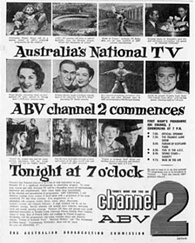 National broadcaster ABC launches its Melbourne channel ABV2. The opening program includes previews of upcoming ABC programs as well as interviews with Olympic athletes Chris Chataway and Shirley Strickland — leading up to the Opening Ceremony of the 1956 Melbourne Olympic Games just a few days later. HSV7, entering its third week of regular transmission, is on the air from 6.00pm including two 15-minute news bulletins. GTV9 is only operating in test broadcast mode, with a test pattern during the afternoon only.